ID: 2416 ~ Source: KKK Collection, The Texas Collection, Baylor University. 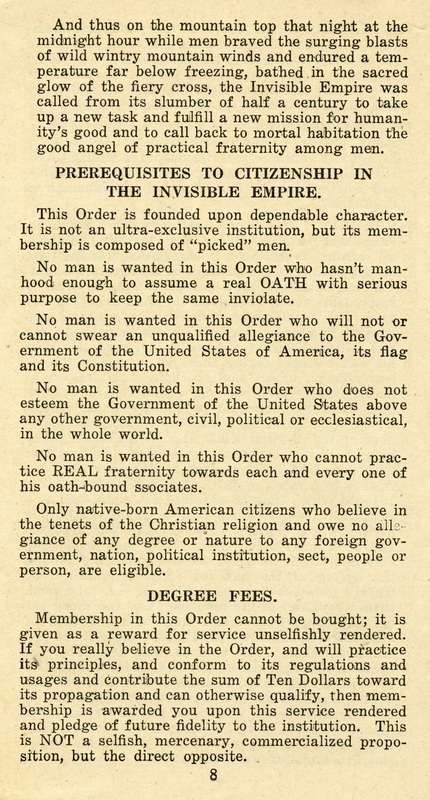 Requirements for Membership: Members had to be Caucasian, native born, and Protestant. The original goal of the “kleagles,” or recruiters, was to recruit upper-class Americans who could potentially influence politics. Once these men legitimized the local klaverns, membership was opened to middle- class individuals and later lower-class persons when the Klan wanted to boost its numbers and finances. The Klan provided a sense of superiority particularly for lower-class whites.